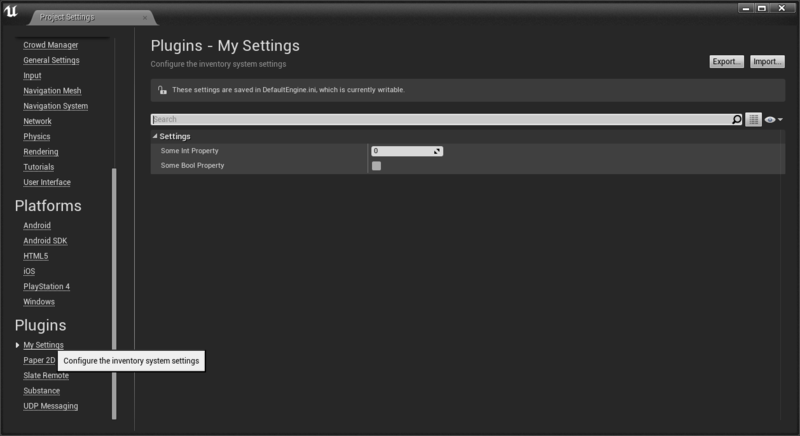 The Project Settings page in UE4 is a menu which lets you customize a whole bunch of settings for your project. But did you know that you can add your own settings in there? Its quite simple! Once you’ve declared your settings class, you need to use the Settings Module to register it. Start by including the ISettingsModule header – #include "ISettingsModule.h"
Then you can quite simply call the RegisterSettings function! The first three parameters of the RegisterSettings function are simply to place it in the Project settings, the Plugins section on a page called My Settings. Don’t forget to also call UnregisterSettings.